I blame my neighbor. I do. Because she knows how much I like to cook and bake and make tasty treats for myself, my roomie, my friends, my co-workers, and just…people in general. So, while she was out at one of the discount stores, she snagged me four (4)…yes…FOUR…boxes of the Pillsbury Gluten Free Sugar Premium Cookie Mix and one (1) box of the Immaculate Baking Company’s Gluten Free Fudge Brownie Cookie Dough. I love it when she surprises me with gluten free goodies. All that being said…I was out at Michael’s a couple of weekends ago and spotted a T-Rex cookie cutter. Don’t judge. My roommate loves dinosaurs. Yes…she’s in her mid-30s…but…that’s just who she is. And then…there was the Unicorn cookie cutter. UNICORN COOKIE CUTTER. I used to have a unicorn collection. I am a Boston Marathon runner. Unicorns are sort of my spirit animal. Now, sugar cookies and I don’t have the best relationship. Every time I have attempted to make them, be it from a mix or from scratch…they have been ultimate fail. And, while the Pillsbury Gluten Free Sugar Premium Cookie Mix gives instructions for round cookies, I really wanted to make cut-out cookies. So, learning from my past in sugar cookie baking, I made up the dough and wrapped it in Saran wrap before sticking it in the back of the fridge and letting it chill while I was out and about running errands that day. That afternoon, when I returned…and called my dad to wish him a Happy Father’s Day…I set out rolling out the chilled dough between two pieces of plastic wrap, flattening it out. 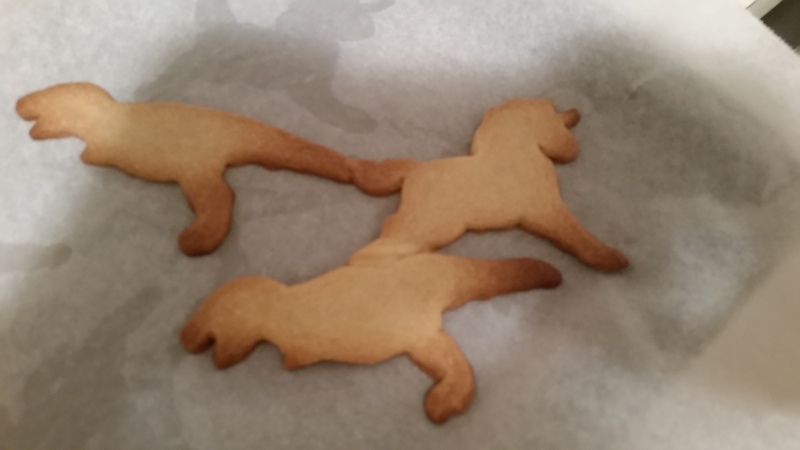 Then, I took my new cookie cutters and carefully (there were some really tiny parts that were not easy to come out of the cookie cutter (hello unicorn horn)) cut out T-Rex and Unicorn shapes as I chatted with my dad. The mix set up perfectly for this…and I kept it chilling when I wasn’t using it. So, onto a baking sheet these cookies went and…BAM…into a preheated 375°F oven. So, while these are virtually baking in my blog, let me tell you how easy this mix is to make. All you need is the cookie mix, 1/2 cup of butter (I used Earth Balance Vegan Butter Sticks – room temperature), 1 tablespoon water, and 1 egg. Simply combine all of the ingredients in a medium bowl and mix until soft dough is formed. From here, you can form dough by rounded teaspoons and put onto a baking sheet 2 inches apart…or you can chill it like I did (this was me being stubborn…I wanted cut-out cookies, dammit!) and roll it out after it’s chilled and cut out fun shapes like dinosaurs and unicorns. Adults can have fun-shaped sugar cookies too, you know? I lost track on the first batch as my dad was a fun and worthwhile distraction. These bake for about 8-10 minutes, except in my oven, because it is old and doesn’t get as warm as it says at times. So, the cookies weren’t ready after 10 minutes, so I figured I’d go for 2 more minutes. Didn’t set a timer, and as I was rolling out the second batch and chatting with my dad…remembered those were in there and pulled them out. The edges got a little toasted, but they were still fine. I noted, much to my dad’s amusement, that the unicorns became fat unicorns. They did spread slightly…but still resembled the original shape. While out grocery shopping early that weekend, I picked up a jar of Dollop Gourmet Hot Chocolate Spread Frosting. And some green sparkle sprinkles for the dinosaur cookies. I had rainbow sprinkles at home already for the unicorn cookies. HA! So, after the cookies cooled and I was off the phone and not browning the edges of the rest of the cookies, I cooked dinner…and knew these cookies would be dessert. I snagged one T-Rex and one Unicorn cookie and gave each a schmear of the Dollop Gourmet Hot Chocolate Spread Frosting. Topped each off with some sprinkles…and dessert was ready. I have been really impressed with the Pillsbury Gluten Free products, and these were no exception. This mix was not only easy to make…but tasted great. I always had a soft spot in my heart for sugar cookies (I used to bake them with all the neighborhood kids at a neighbor’s home every Christmas)…because they are so versatile. Top them off with frosting, sprinkles, stuff them with ice cream, or more frosting…add nuts or chocolate chips…the possibilities are endless. Sugar cookies are the ultimate decoration cookie. And while I’m not big on frosting at all (I really am not a fan), these required delicious frosting (hence…Dollop Gourmet), and sprinkles…because sprinkles are awesome. Know what else is awesome? These cookies. They have that buttery flavor, with a touch of the sweetness from the sugar in the mix. I asked my roommate what she thought and she said they tasted just like “regular” sugar cookies. And they should. The only difference is rice flour and tapioca starch and potato starch replace the all-purpose flour that would go into regular ones. These cookies have that nice crunch on the outer edge with a soft center. SO good. And this made SO many of these. So, I have sugar cookies for days…and am wondering if I’ll ever run out at this point. At least they are amazing and yummy. So, let’s discuss what Pillsbury puts into their Gluten Free Sugar Premium Cookie Mix, shall we? This mix is a blend of sugar, rice flour, tapioca starch, canola oil, potato startch, contains 2% or less of: salt, baking soda, cellulose, xanthan gum, cellulose gum, natural and artificial flavors. As for nutrition information…keep in mind…these are sugar cookies. Mmmm…cookies. COOKIE MONSTER strikes again. Anyway, a serving size is 1/18th of the mix (if you make the drop cookies, this box makes 3 dozen; if you make the cut-out cookies, it varies. I got 22 cookies in mine). A serving size (for drop) is 2 cookies and for the cut-outs 1 cookie. This serving (when prepared per package instructions) will provide you with 160 calories, 6 grams fat, 3.5 grams saturated fat, 0 grams trans fat, 25 mg cholesterol, 240 mg sodium, 24 grams carbohydrates, 14 grams sugars, 1 gram protein. I am very happy with the mix that Pillsbury has created for those of us who, perhaps, missed the amazing cookies that a company like Pillsbury puts out. I am also intending to use a box of this to make Strawberry Streusel Bars or Peanut Butter & Jelly Bars for the office birthday party that is happening next week. Just have to decide on which one I want to make. Trust me, with an office that usually turns its nose up at anything that is gluten-free, I wouldn’t serve this mix to them if I didn’t think it was worth it. Thank you, Pillsbury, for making gluten-free baking mixes for those of us who love to have an easier and more convenient way to make cookies. Especially sugar cookies. Because sugar cookies are evil. But this was so easy and my cut-out cookies were…perfect. And that always makes this cookie monster happy!! 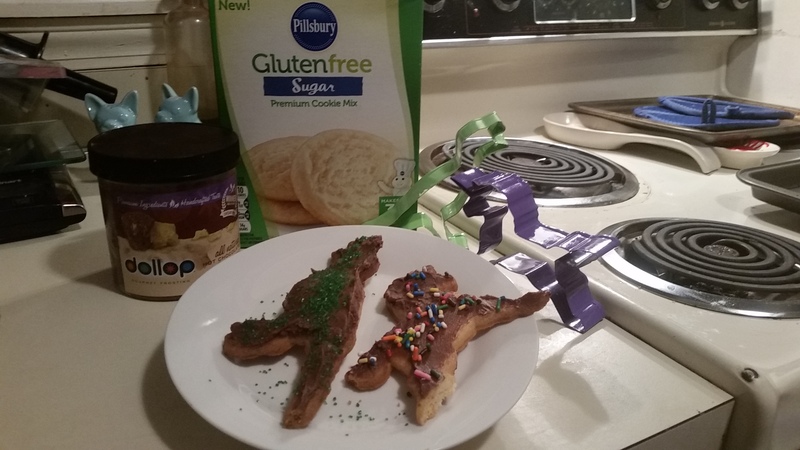 This entry was posted in Baked Goods, Chocolate, Cookies, Dessert, Dough, Food, Fruit, Gluten-Free, Mix, Products, Recipe, Review, Snacks, Spreads, Sweet Stuff, Vegetarian by The Celiathlete. Bookmark the permalink.